Click on banner to enlarge image. Gateway News and Burn 24/7 invite you to join us at “Jesus Day in the Park” — a day we trust will be a time of refreshing, renewal and inspiration in the presence of the Lord in a picnic atmosphere in St George’s Park on Saturday December 15. All are very welcome. Come with your family and friends to the park entrance opposite St George’s Hospital — any time from 9am to 5pm. Come and soak in His presence, come and picnic and fellowship; come and praise and worship the King; come with hunger and expectancy for revival; come and listen to inspiring messages; come and hear testimonies of God’s goodness and transforming power and of what He is doing in the city; come and take part in a treasure hunt or other Jesus adventure. Some of the confirmed speakers are Pastor Zolile Dayimani (@12pm) — introducing Phila Ndoda, a new citywide movement that is calling on men to stand up, speak up and come alive, and Afrika Mhlophe (@4pm) — a pastor, author and chairman of the Gateway News board, and Paul Mbongelo, a missionary intercessor from the DRC who I will say more about later in this report. Visit our Jesus Day in the Park event page on Facebook ( https://www.facebook.com/events/2097022107025121/ ) for updates on programme highlights that will be posted during the countdown to this special day. And please share the news widely. The idea of the Jesus Day in the Park was inspired by a prophetic word for South Africa ( http://gatewaynews.co.za/an-old-fashioned-tent-meeting-is-able-to-save-the-nation/ ) that was first released in PE in August by Paul Mbongelo, simply saying: “An old-fashioned tent meeting is able to save the nation”. After PE, Mbongelo went on to release his word in the remaining eight provinces of SA. 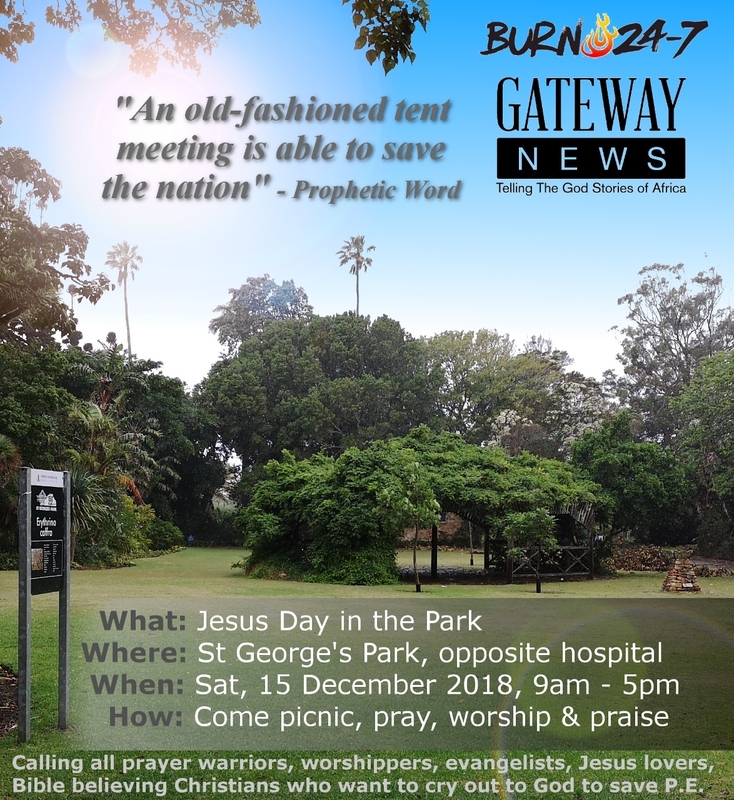 During a recent weekly Gateway News prayer meeting, Justin White, a member of our board, came up with the idea of Gateway News hosting the first tent meeting — in St George’s Park. The park authorities don’t allow tents in the park but the Lord has provided a splendid natural tent in the form of a leaf-covered pergola (see poster above). As we gather in the park with the fiery worship leaders from Burn 24/7 we will be the Tent of Meeting where the Lord encounters His daughters and sons. The Jesus Day in the Park on December 15 will be the first “old fashioned tent meeting” in response to the prophetic word. Another is planned for Bloemfontein on December 22 to 23.